Nick Holme. I used to be a managing editor for the publishing division of a events company. We did magazines niche-market and books. Nick was one of my reports. He joined us as an intern and worked his way up to senior designer, so I had watched his progress over an extended period of time and had always been impressed with him. He was imaginative, talented and easy to work with. He listened, which is very important. I’ve worked with designers who found that difficult and tended to be a tetchy if you wanted any changes with their initial design. But Nick is one of those people who recognise that publishing design is a collaborative effort. And we knew each other well, which was helpful. Even though we had both left the company he was still up for working with me on a freelance basis. Quite a bit. We sat down and talked about the book and bounced ideas off of each other. At some point, however, you just have to let the designer get on with it and see what they come up with. Also, you find you have to keep the brief, well, brief. Don’t confuse things with too many details. It’s a chance to improve your own communication skills! The nice thing about self-publishing is that you do have input into the cover. I’ve been traditionally publishing and, well, you have no input at all. You take what’s handed to you. As I said, we talked, bounced ideas around and then I left him to it. He came back with an initial design that was amazing – a real WOW! But I wasn’t sure it was the right one for The Knightmare. It was quite testosterone-charged, a young man’s cover. The Knightmare is a book that has as much, probably more, appeal to women than to men. I passed the cover around to friends, some of which knew little if anything about The Knightmare and asked them what the cover said to them. Would they pick up a book with this cover? What kind of book did they think it was? It was the shopper’s response. I also took it to a bookstore and asked them where they would place it, given the cover. We found that everyone thought it was far more a ‘blood and guts’ type of book than it is, one even said ‘horror’, so it wasn’t representing the book properly and targeting the right audience. So we went back to the drawing board and simplified the cover and the ideas. Nick had to get in touch with his feminine side – which was a hoot! But he was well up for re-thinking our ideas. Yes. Very. 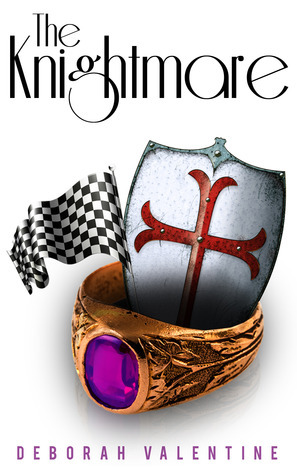 It’s clean, simple and incorporates three key elements in the story: Formula 1 racing, the Knight Templars and the ring, which is so important to the story. Nick also gave me a choice of fonts for The Knightmare title, and I really love with the one we settled on. And the cover received some kudos from Shelfbuzz, which was nice. That the story incorporates history and the present, action and romance – and that it’s fun! As he is recovering from his injuries Conor’s childhood nightmare recurs, a strange jumble of terrifying images that feel more like memories than dreams. Can it be mere coincidence that the very next morning he is informed a mysterious woman with whom he had very brief affair has died and left him as her heir? But this was no ordinary woman and no ordinary affair. Dogged by a niggling feeling of déjà vu, Conor travels to Amsterdam to identify the body. At her home he finds an illuminated book that transports him back in time, to a woman he left behind and a life lived in the shadow of a tragedy that cries out across 800 years for resolution. Weaving history with the present, fact with fantasy, The Knightmare is an unforgettable story of angels and alchemy, betrayal and sacrifice, and a truly extraordinary love. My Thoughts: I like the simplicity of the cover. There are only a few images that really draw the eye, and the rest is soothingly open. The cover readily ties into the summary with the race flag and the templar shield. I like that it’s different from most romance covers, but it might be a bit too different in that the cover is still quite masculine looking.